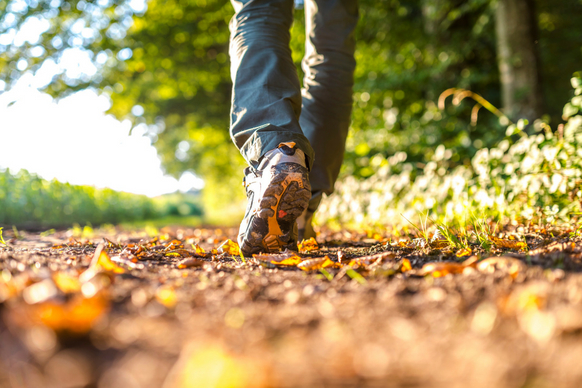 The challenge is to walk nine miles throughout September while collecting sponsorship. The miles can either be done in one go or spread across the whole of September, whichever suits. Anyone can sign up for the challenge. 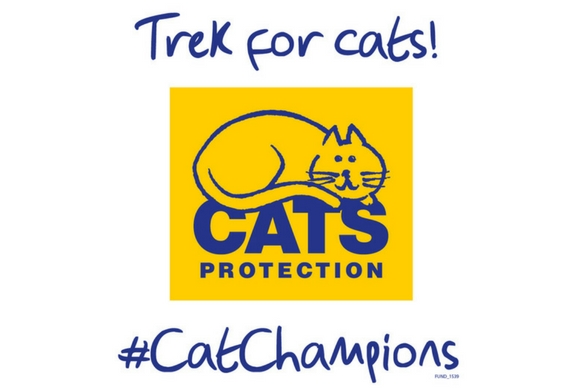 To find out more follow the link https://www.cats.org.uk/9miles. Alternatively, if you are unable to sign up online contact 01825 741960 for further details. As a charity, we rely solely on the generosity and kindness of public donations to enable us to go on caring for cats and kittens. There are many ways you can support the work of the Wrexham Adoption Centre. Join easyfundraising and you can collect free donation for us every time you buy something online. It won't cost you a penny extra, so please help us to raise funds. Would you like to donate to Cats Protection while shopping online with no extra costs? AmazonSmile is a scheme which Amazon customers are able to donate to a charity of their choice each time they shop online, with no added cost to the customer. This can be done by simply logging in with your amazon log in details- www.smile.amazon.co.uk and selecting Cats Protection as your choice of charity. With each purchase, Amazon will donate a portion of the purchase to the charity. 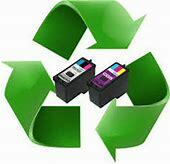 Do you have printer inkjet cartridges that you would like to recycle? Would you like to help raise funds for Wrexham Adoption Centre, simply by recycling your old inkjet cartridges? Recycle 4 Charity is an organisation that takes any used inkjet cartridges and donate £1 per cartridge back to Wrexham Cats Protection. If you have any that you want us to have, then please feel free to drop off as we have the envelopes here at the Adoption Centre, where we can then send them off. Or alternatively, we can give you an envelope to take away to collect your old cartridges. Did you know that the everyday post that you receive daily could help raise funds for the cats in our care? If you cut out the stamps from the post you receive, and keep them to one side for us, we can send the stamps off to raise money. Ideally stamps should be cut from the envelope leaving at least half an inch of paper around the entire edge of the stamp. Anything closer and the stamp loses its value, torn or disfigured stamps are of no use as they have no value unfortunately. Both British and overseas stamps can be sent off, so why not start collecting your used stamps for us today. Our Charity Shop in Wrexham town centre can make use of unwanted gifts, clothes, books, DVD's, CD's, magazines, jewellery and bric-a-brac. At this current time we are unable to accept electrical items or large furniture items. The new shop located at 11 Lord Street and is now open from 9.30am to 5pm Monday to Saturday. If you have a large donation that needs to be collected please contact the shop directly on 01978 266300. We apologise for any inconvenience, but we are no longer able to accept any shop donations to the adoption centre, due to the lack of storage. 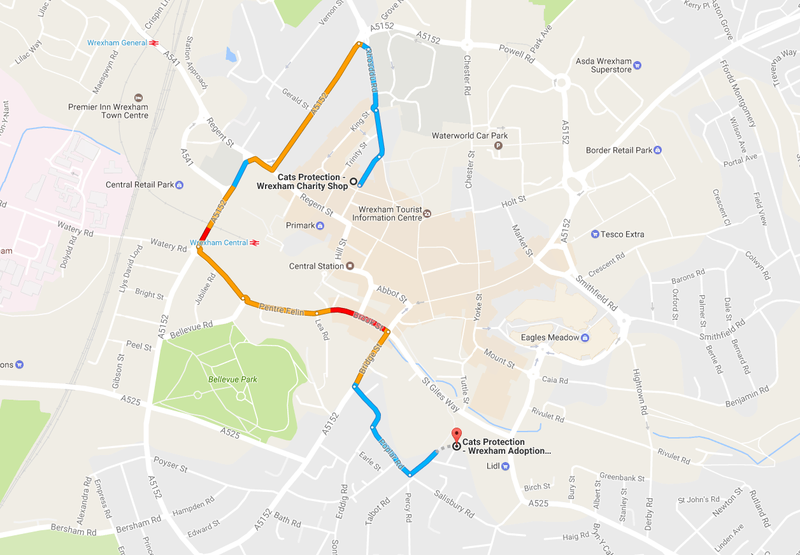 This map shows how to get to the Charity shop from the Adoption Centre. You can now also support us through our Amazon Wish list - this is a list of items that we would be very grateful to receive, including food, toys and consumables for the centre, which you can buy online and can be sent straight to us. Please follow the link! Our weekly lottery started in June 2013. For just £1 per play there is a chance to win cash prizes, you can enter more than once if they want to increase your chance of winning! The winners are drawn every Friday and are published on the National Cats Protection website. We are always grateful of items that help keep our Adoption Centre running costs to a minimum. Cat food, toys, beds and carriers, cleaning products such as liquid hand soap, towels, cloths, sheets, bin bags and stationery items such as bubble wrap, A4 paper and pens are always appreciated. We would also appreciate donations of balls of wool, some of our volunteers have been kindly using the wool to make blankets that we can sell at the centre. If you or your business have items to donate, bring them along to our Adoption Centre or Charity Shop. For information contact our Adoption Centre 03000 12 02 69. It is thanks to the wonderful kindness of people who remember Cats Protection in their wills that we are able to carry out much of our day to day work. These special gifts fund more than half of everything we do and are vital to our work helping abandoned and unwanted cats and kittens. We are incredibly grateful for every gift we receive, no matter what the size. Even the smallest gifts help us to provide cats with food, a warm bed, veterinary attention and most importantly of all, find them a loving home. We would like to say a massive thank you to everyone for their support.